The truth is we do not need to FIX Obamacare nor implement another medical expansionist program run by the federal government in order to meet the needs of the American public. The number of citizens not enrolled in a medical program is not as great as the government propagandists would have us believe. The majority of these uninsured are middle-class citizens who chose to be uninsured because they feel they did not need to pay for bloated policies or thought they were healthy enough to not need medical care coverage. Being forced to buy overpriced policies in order to subsidize others who pay little or nothing for the same coverage is not a wise financial decision. If the government would actually get out of the way and stop trying to centrally manage our entire healthcare community then individuals would have more freedom to chose or not to chose the coverages they want or can afford. The horror stories that the politicians would want you to believe is that many would die in the streets or be thrown off of medical plans they now have. Of course, they forget the number of persons who lost coverage when Obamacare was thrust upon them, remember the whole if you like your coverage you can keep your coverage lie? Anyway, this well-written article answers the propagandists with the hard truth of how things really are in America since the implementation of Obamacare. The first part of the statement is questionable and disingenuous. The vast majority, about 18 million of the estimated 20 million in question, had obtained health insurance only because they had been compelled to do so or pay the penalty imposed by ObamaCare for not having insurance. The rest have subsidized coverage paid by others saddled with higher premiums. The second part of the statement is even more disingenuous because those “reaping the savings” are merely the ones being allowed to save some of their own money, instead of subsidizing others. The GOP plans revoke these impositions and bring more freedom rather than wealth redistribution. But the verbiage in the writer’s statement is typical Democrat rhetoric pushing the debate towards socialism rather than freedom. Some of the reasons people use for voting for Trump are the same reasons not to. It is argued that since Trump is from a very liberal New York that he has had some democratic leanings. …understatement of the year right there! One poster writes that “I’m from Philadelphia and used to be a moderate”.. I too used to be from Philadelphia, attended city schools, and have never been a moderate nor a democrat. I had parents who were not political nor religious, but by the time I reached high school I knew then that Social Security was a con game. So location does not determine ones political leanings, nor policy positions, ideology does. Trumps ideology lines up nicely with the progressive democrats and republicans whom he has supported liberally in the past. He has stated on a number of occasions that he gets along well with Pelosi and Reid and Schumer. These are not the words of a Constitutional Conservative nor someone who values limited government. While Conservatives and TEA Party members were fighting Pelosi and Reid Trump was contributing to their campaigns. When we were attempting to remove Mitch McConnell for his feckless leadership Trump was supporting his renomination. He’s a business man, and as such has had to get along with both sides to do business…. They say great minds think alike, or better put the student can only be as smart as the teacher (Matthew 10:25). Perhaps that is why Ronald Reagan shared the same thought as did Paul when he was writing to Timothy about those who did not believe what Paul was teaching. Paul said in 2 Timothy 3:7 they are “always learning and never able to come to the knowledge of the truth.” Paul was referring to men or women who were willful, boastful, proud, arrogant, self-absorbed, money hungry, chasing after pleasures and not seeking God. These folks are constantly chasing one passion or another, looking for the next big thing, seeking fame and fortune, never acknowledging God, in fact, attacking what is good if it interferes with their personal pursuits. They are always learning but never able to grasp what is real and true. They believe that what they believe is truth, but who can blame them since they were taught by those who believed they too possessed great knowledge and charged handsomely for others to get that knowledge. Unfortunately, all that knowledge left them bereft of truth but now they have been awarded a certificate of accomplishment validating their intellect, although like Reagan said, they know so many things that just aren’t so. While making his 50 state Decision America Tour Franklin Graham spoke about the need for God back in the American political process. He found fault with both political parties and called upon Christians to pray for their nation and to repent of their and the nation’s sins. Leading evangelist Franklin Graham speaks at a Decision American prayer rally held in Columbia, South Carolina on Feb. 9, 2016. I agree with Mr. Graham that America has tossed God out with their progressive humanist secularism, but I can not lay the fault at the feet of the politicians the voting public chose. The focus of my concern is with the dereliction of duty of the Christian church, and the Christian home. Persecuted Christians left their homelands and traveled across a dangerous sea to find a place where they could worship God freely and without government persecution. The pilgrims set up a colony in Massachusetts that had a lasting effect on the new nation being born. In fact, the Mayflower Compact was instrumental in the Constitution. In this recent Gallop poll 40% of those surveyed called themselves conservative with 56% of the respondents calling themselves either liberal or moderates. I have long contended that moderates are simply liberals refusing to acknowledge their true identities. Wearing the label ‘moderate’ does not bring with it the same baggage as those who wear the label of ‘liberal’. So then if moderates are only closet liberals it is easy to understand why our country is leaning so far left. 56% of the population are liberal or liberal leaning. It is possible that some of the moderates would lean toward conservatism but personally I do not think this is proven in another study I cite below. Did you notice anything strange about this table? If according to the above Gallop Poll 40% of the population is conservative why are liberal spending programs not favored by 40% of the population for limited spending? It seems strange the socialistic programs of Social Security (notice the word SOCIAL is in the title) and Medicare are not even considered by these “conservatives” for spending cuts. The only program that receives the majority of votes for spending cuts is in foreign aid. Basically then if this study proves to be accurate 71% of the American people surveyed prefer socialism at home and not abroad. Considering foreign aid only amounts to 1% of total government spending I am afraid Socialism is here to stay in America. 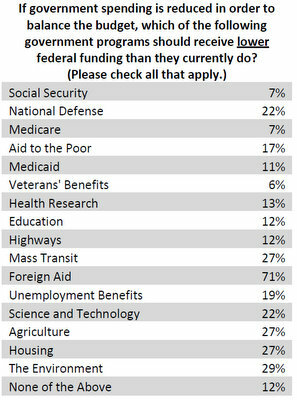 The vast majority of people in this country—including a large chunk of those identified as conservative remain closet socialists on social security and medicare, and really for almost every category of public spending. Those who responded to the Gallop poll that they are conservative have some real explaining to do. How can you call yourself a conservative and vote for continued Socialism in America? The direction America is going is the opposite of what the founders of this great nation fought and died for. Listen to the words of Thomas Jefferson as penned in the Declaration of Independence, the list of grievances the colonies had with King George. Where it says he replace it with Obama and then ask yourself if you still consider yourself a conservative. Thoughts and views as seen from the resident raptor. Reflecting on life and the world as I see it. All opinions and comments expressed on this site are simply one man's opinion on how I see things. A journey of a thousand miles begins with just one step. Each step, each place of rest, each observation brings with it some significance, so come along with me as we Journey Across the Sky. Daily Bible verse plus a picture of God's creation following Wayne Cordeiro's "The Divine Mentor" format.